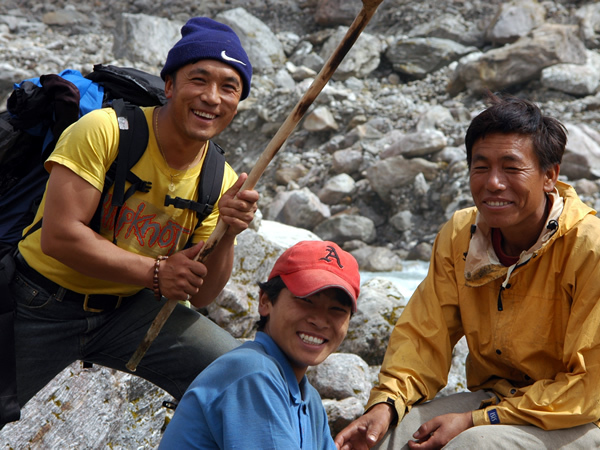 These 3 lovely fellas were part of our team in 2004 they are all Sherpa. Pemba like clockwork every 4 hours 'Medicine Nettie medicine'. He doesn't own a watch! Being born at altitude for so many generations Sherpa have more red blood cells, more efficient hearts and more capillaries in muscles than westerners. Even the Chinese who invaded Tibet in 1950 and have lived there since (3 generations) haven’t developed the Sherpa genetic adaptation to altitude. But I think the most amazing things about the Sherpa that I’m lucky enough to call friends are their beautiful smiles, wicked senses of humour, their strength on the mountain and their desire to see me do my best and keep me safe.